Cruising through the week . . .
Too late with a photo. 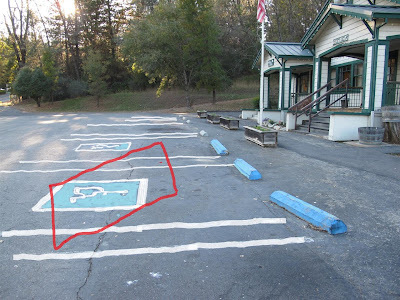 As I was going into the bank on Tuesday, a lady drove her car into the position indicated by the red rectangle below, thus taking up the two large handicapped spaces. Both of them. With an air of entitlement. I was too chicken to take her photo, but since I got into the bank before she did, I thought I could get a shot of the car thusly parked, on my way out. However, I got hailed down in the bank by one of the tellers who was about to email me with some info I'd requested. Conversation ensued, and the lady was in her car and pulling away by the time I got outside. Here's a piece of the route I'd passed exactly one year before, both beautiful days. This is a big lake. Nostalgia. When my husband was still living, we'd take long boat rides to the other end of the lake, or he'd fish and I'd read a book, thanks to Sea-Bands®. Barbara B makes a face when she sees me with camera in the Excel class . . .
"I stuck my tongue out." "Well, I just guess I'll have to put it in the blog that way." Maybe she'll smile for the camera in tomorrow's class! Full moon rising . . .
Color on Thursday . . . I love this one. Too bad it's little-kid-sized. Paula made it. Rose is making colorful mitten and sox sets for her grandchildren. These are the mittens. Fingerless. Apparently that's in. The sox will not be identical, one to another within a pair, due to the variegated yarn, which violates Rose's sense of how sox should be. But this is a new age. If she really wants to mix it up, she could scramble the pairs. Rose is making a colorful scarf for herself, too, out of this eyelash yarn, I think it's called. She models it so far. This is the scarf that Barbara K is knitting. It shows its colors well, but not its shape, lying there on the table. Judy has the world's largest stash of prospective projects. She has never met a project she didn't want to try. This is a kit of fabric strips, to be knitted into a tote bag, that represents some long-ago fad. Then there's me, who just can't resist taking sky pictures. I should put them all in a collection . . .
What a beautiful lake. I'm sure it conjurs many wonderful memories. And those last pictures with the sky-speckled clouds, looks like snow is just stuck there. Nice.